Depictions of human evolution may be the most recognized of all Darwinian “icons,” as most people have been exposed to images such as those in Figure 1 since their youth. As recent fossil finds have transformed this icon into a complex timeline, as in Figure 2, paleoanthropologists continue to insist that the strength of the fossil evidence mandates viewing human evolution as a scientific fact. Even as other Darwinian claims have been increasingly abandoned, the staunch defense of this last icon has continued and intensified. This paper explains that Darwin’s last icon has now fallen. In other words, a critical review of the fossil record using the information in the scientific literature leads to the conclusion that there is no viable evolutionary sequence leading from a common ancestor with the chimpanzee to modern humans. The scientific literature refers to peer reviewed periodicals (e.g., Nature, Science, the Journal of Human Evolution, etc.) where fossil finds are first reported and evaluated. While these periodicals are religiously committed to the “fact” of human evolution, the validity of each claimed transitional form is openly debated therein, often with information that is screened from high school and college biology textbooks. Since there are so many claimed transitional forms, arguments among evolutionists that any particular transitional form is not an ancestor of Homo sapiens does no harm to their underlying faith in human evolution. This paper repeatedly references the scientific literature to show that evolutionists now question the legitimacy of every claimed transitional form and that, using any reasonable standard, most of these claimed intermediates have been completely discredited. This, in turn, leads to a logical conclusion that evolutionists cannot make for philosophical and professional reasons—that there is also a collective failure of all claimed evolutionary sequences leading to Homo sapiens. It is relatively easy to see that Darwin’s last pillar of support has now crumbled, provided the reader objectively considers the evidence and reflects on problematic presuppositions that may have been held (perhaps unconsciously) since childhood. These presuppositions can include the view that: 1) empirical science is the exclusive source of truth; that 2) scientists are always objective and aren’t influenced by their worldview (scientists don’t lie); and that 3) truth claims about human origins must be grounded exclusively in the domain of natural science and—no matter how poor the evidence for evolution—cannot involve historical theology (i.e., Special Creation cannot be true). These presuppositions result in the mistaken view that the evolutionist’s a priori decision to construct a wall of naturalism around origins constitutes “good science” rather than a flawed philosophical approach that forbids two very logical conclusions. These conclusions are that: 1) the claims of human evolution are not supported by the fossil record; and 2) to the degree that sound inferences can be drawn, the fossil evidence is most easily reconciled with Special Creation. Given the historical consequences of Darwinism—namely, its foundational role in the ideologies leading to World WarI, World War II, the spread of communism, the humanist takeover of public education and the judiciary, the legalization of abortion and the on-going culture of death, as well as much confused theology and various attacks on the family—continued belief in human evolution constitutes a tragedy of immeasurable proportions and is arguably the most harmful deception in the history of the world since the Fall of Adam and Eve. This tragedy continues, in part, because of the permissive silence of Catholics toward a deception that could have been recognized and systematically opposed had we been obedient to the mandates of the encyclical Humani Generis (1950): 1) not to treat evolution as “completely certain and proved by the facts” (par. 36); 2) to study the “reasons for both opinions…those favorable and those unfavorable to evolution” (par. 36); and 3) to be aware of those who “desirous of novelty, and fearing to be considered ignorant of recent scientific findings” are “in danger of gradually departing from revealed truth” (par. 10). This paper critically evaluates the claimed transitional forms in Figure 2 called “hominins,” generally defined as humans and their close extinct relatives (sometimes the term “hominids” is used in the same sense). 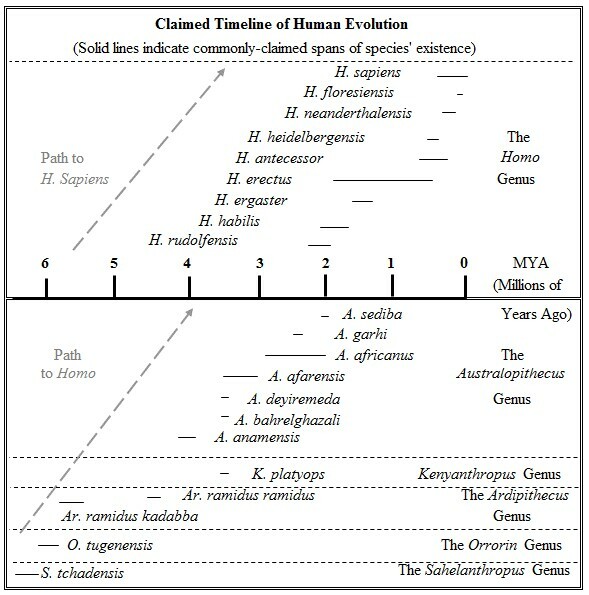 The ancient dates assigned by evolutionists to the various species shown in Figure 2 are problematic, and other evidence presented in these proceedings by Dr. John Sanford and Dr. Robert Carter demonstrates that the time-line of human history is much shorter than the evolutionary time-scale. Thus, the use of the conventional dating should not be construed as an endorsement of the now-totally-discredited evolutionary time-line for human history. Nevertheless, the evolutionists’ dates are used herein to illustrate that, even if the dates were valid, there would still not be a viable evolutionary sequence leading to modern man, Homo sapiens. …the backward position of the foramen magnum [the opening in the skull base through which the spinal cord enters]…must have caused the body to incline forward…and the distinctly simian arrangement of the…vertebrae…[testifies] to this fact…the total extension of the knee could not have been normal. There is thus no valid reason for the assumption that the posture of Neanderthal man…differed significantly from that of present-day men…there is nothing…to justify the common assumption that Neanderthal man was other than a fully erect biped…if he could be reincarnated and placed in a New York subway—provided that he were bathed, shaved, and dressed in modern clothing—it is doubtful whether he would attract any more attention than some of its other [citizens]. The view that the Neanderthals were fully human remains valid, in part, because the Neanderthals lived from approximately 130,000 to 30,000 years ago (ya), well within the span of H. sapiens, who evolutionists date to approximately 200,000 ya. The Neanderthals also lived in the same regions of Europe and Asia as H. sapiens, and the average cranial capacity of 1,550 cubic centimeters (cc) is well within the upper range of H. sapiens (2,200 cc). Further, it is now accepted that Neanderthals “may have been as handy with their tools as modern humans are.” This conclusion has been reinforced by the discovery of Neanderthal stone tools, weapons, and decorated grave sites. This fossil evidence has been greatly bolstered by recent genetic analyses of recovered Neanderthal DNA. These studies conclude that between 1 and 4 percent of present day Eurasian genomes are derived from Neanderthals, and that Neanderthal DNA was at least 99.7 percent similar to modern humans., Since a widely used definition of a species is that it consists of individuals who can produce fertile offspring, Neanderthals are properly considered to be part of H. sapiens and this view now dominates the scientific literature. A recent find that has generated much attention is H. floresiensis, which dates to only 12,000 ya. Dubbed “the hobbit,” these Indonesian fossils are puzzling due to the small estimated weight or body mass (16-41 kg) and small cranial capacity (417-426 cc). Among the theories tabled, some speculate that the species descended from an ape-like primate, some believe it to be a type of early Homo, while others believe that H. floresiensis was H. sapiens but suffered from a condition such as insular dwarfism related to the ‘island rule’ in which certain species may “experience a reduction in body size on islands perhaps due to energetic constraints or changes in predation rates.” While this intense debate will no doubt continue, given the very recent dates for H. floresiensis, the outcome is not crucial for the discussion of possible transitional forms leading to H. sapiens. H. erectus has long been considered H. sapiens’ immediate predecessor. H. erectus fossils have been found in Africa, Asia, Australia, and Europe. The species duration is generally described as from nearly 2 million years ago (mya) to less than 100,000 ya. H. erectus is linked to the discovery of a primitive looking skull cap and modern looking femur by Eugène Dubois in 1891-1892 on the island of Java. When viewing the primitive- and modern-looking fossils together, Dubois believed he had discovered man’s ancestor. He named it Pithecanthropus erectus (meaning “erect ape”), but the name H. erectus was later adopted. However, as explained below, there are many reasons to conclude that H. erectus was not a transitional species and that the fossils should be absorbed into or “sunk” into the H. Sapiens classification. In 2003, an article in Science discussed the first-ever erectus fossil (Sm 4) enabling researchers to glimpse a H. erectus cranium base and concluded that H. erectus was “unexpectedly modern” in anatomy. Far from justifying a view that erectus was an intermediate from a small ape-like ancestor, the species is estimated in various studies to have had an average body mass of between 51 kg and 59 kg, which is generally equal to or greater than that of present day H. sapiens. Although such projections are necessarily based on many assumptions, a 2015 article in the Journal of Human Evolution confirmed other studies of a near complete H. erectus specimen (KNM-WT-15000) known as “Nariokotome Boy” that estimated this individual would have grown to between 5’9” and 5’11” in height and weighed between 176 and 183 pounds had he lived to maturity. These descriptions of H. erectus begin to build a strong case that there is little justification to classify these fossils as anything other than H. sapiens. Support for sinking H. erectus grows enormously when it is realized that: a) H. sapiens and H. erectus fossils occur at the same location for extended periods of time; b) fossils displaying features of H. erectus and H. sapiens are common; c) and the scientific literature admits that non-evolutionary factors are sufficient to explain H. erectus vs. H. sapiens variation, which is why; d) even notable evolutionists have called for the sinking of H. erectus and acknowledge that H. sapiens appears in the fossil record 2 mya. We regard the species distinction between Homo erectus and Homo sapiens as being problematic…[due to] the difficulty in clearly distinguishing an actual boundary between Homo erectus and Homo sapiens…We should either admit that the Homo erectus/Homo sapiens boundary is arbitrary and use nonmorphological…criteria for determining it…or Homo erectus should be sunk…sinking Homo erectus would carry the advantages of explicitly recognizing the arbitrariness of the boundary…More importantly, it would eliminate the necessity of relying on dates to determine which species a number of specimens belong to. …there is no distinct beginning for H. sapiens as long as H. erectus is recognized. The earlier species can be seen merging into the later one everywhere they both are found, and because each has some of the morphology of the other there is continued and unresolvable confusion about whether they overlap in time…The best solution…is to cease distinguishing the earlier specimens on the lineage as H. erectus, and instead include them in H. sapiens. After appropriately sinking H. erectus, Wolpoff concludes in his leading college textbook, Paleoanthropology, that H. sapiens appears in East Africa nearly 2 mya and precedes the earliest appearance of H. habilis. These relative dates would eliminate H. erectus and every Homo species in Figure 2 as human ancestors, except possibly H. rudolfensis. …when we find that significant differences have developed, over a short time span, between closely related and contiguous peoples, as in Alaska and Greenland, and when we consider the vast differences that exist between remote groups such as Eskimos and Bushmen, who are known to belong within the single species of Homo sapiens, it seems justifiable to conclude that [Peking Man, now H. erectus] belongs within this same diverse species. The most significant difference between H. sapiens and H. erectus is that the latter had an average cranial capacity of approximately 1,016 cc versus 1,355 cc for H. sapiens. However, H. sapiens has a very large range in cranial capacity. Estimates commonly place the range for humans to be from 2,200 cc down to approximately 800-850 cc (some estimates go down to 700 cc). By comparison, the adult range for H. erectus is generally from 650 cc to 1,300 cc. While not fitting entirely within the range for H. sapiens, there is much overlap, and the convention is to assign skulls to Homo when the capacity is 600 cc or larger. So the issues are whether the small cranial capacity of some H. erectus fossils would prevent their classification as H. sapiens, and whether the small relative size of some fossils can be explained by nutritional issues or other non-evolutionary factors. The remarkable variability of the specimens found at Dmanisi may support this radical revision…perhaps our ancestors were as variable in size as humans are today. Why not? After all, Shaquille O’Neal and Danny DeVito are members of the same species. Is it possible that the scientists who have given new species names to every early Homo find with significant differences have made our family tree more complicated than it really is? It should also be kept in mind that a smaller cranial capacity in humans does not correspond to lower intelligence, and H. erectus is widely accepted to have used fire and is even thought to have constructed sea-worthy craft. Based on this admission, the question becomes: a) since H. erectus morphology and function generally falls within the normal variation seen in H. sapiens, and since b) non-evolutionary factors can cause H. sapiens fossils to appear as if they were H. erectus, why is a H. erectus classification necessary? This is problematic because it raises questions of how H. erectus survived so recently if it was locked in the struggle for survival with a superior species, H. sapiens. Very likely, the two classifications are not necessary and H. erectus fossils can be placed into H. sapiens. I refuse to let myself be influenced by considerations concerning the sediment or age…a bone which shows all the characteristics of a human [bone] must be considered as such. When after determining this, it is said that…the bone could have belonged to an intermediate species, one is abandoning the domain of facts without any plausible reason. But if the femur is properly classified as H. sapiens and dates to approximately 1.5 mya, the fossil creates a contemporary status problem. Namely, how can one claim that H. erectus gradually evolved into H. sapiens 200,000 ya, when H. sapiens lived alongside H. erectus more than 1 mya? The most logical solution would be to recognize that H. sapiens dates well before 200,000 ya and varies widely enough to include fossils currently classified as H. erectus. This solution is better than other alternatives that could include: a) proposing that Dubois just happened to find a location that preserved the H. erectus and H. sapiens transition, b) claiming that the date for the femur is off by 1.3 million years, or c) reciting the misplaced mantra that “claiming H. erectus and H. sapiens cannot co-exist is like saying modern humans and chimpanzees cannot not co-exist” (note: this argument is misplaced because it does not address the ancient fossil date for H. sapiens; because no one suggests that chimpanzees evolved into and were replaced by H. sapiens; and because of the dating issue explained immediately below). The proposed solution of sinking H. erectus is clearly better than the alternatives when it is realized that fossils described as indistinguishable from H. sapiens (and artifacts best assigned to H. sapiens) are not only contemporary with H. erectus, they actually predate H. erectus by a very long time. Some examples follow and illustrate that H. erectus did not evolve into H. sapiens. Why then, was KP-271 not classified as Homo, and even Homo sapiens? Because the fossil did not fit expected evolutionary sequences, and so it was classified as australopithecine and studies arguing for this classification were soon forthcoming. Even so, such an approach does not address the fundamental question of how H. erectus could have evolved into H. sapiens when fossils indistinguishable from H. sapiens appear 4.4 mya according to many prominent evolutionists. This problem is resolved if H. erectus is sunk into H. sapiens and if it is acknowledged that H. sapiens dates to much earlier than 200,000 ya. Make no mistake…They are like modern human foot prints…The external morphology is the same. There is a well-shaped modern heel with a strong arch and a good ball of the foot in front of it. The big toe is straight in line. It doesn’t stick out to the side like an ape toe, or like the big toe in so many drawings you see of australopithecines in books. …the trails…were portrayed as remarkably human. Yet they were presumed to have been created by Australopithecus afarensis…My problem in accepting this was that the Hadar beasts had apelike features (notably, down-curved toes)…The proportions of Laetoli G-1 and G-3 prints are well within the range found among the Machiguenga…[both] exhibit strong heel, ball, and first toe impressions and a well-developed medial longitudinal arch, which is the hallmark of human feet…the 3.5-million-year-old footprint trails…resemble those of habitually unshod modern humans. None of their features suggest that the Laetoli hominids were less capable bipeds than we are. Elsewhere, he commented on the: “remarkable humanness of Laetoli hominid feet in all detectable morphological features. Per contra, the toes of… Australopithecus afarensis, are intermediate in length between those of humans and apes…and, they are curved, like those of apes.” In sum, A. afarensis is a very questionable candidate for the Laetoli footprints. The most logical assignment of the footprints is to H. sapiens unless classifications are to be made based on preconceived evolutionary sequences (which happens repeatedly). But, again, if artifacts dated to 3.6 mya are best assigned to H. sapiens, how could H. erectus have been our predecessor? Further, even though H. erectus is dated only to approximately 2 mya, there is increasing evidence that an adept tool-maker was present between 2 and 3 mya. For example, the Gona site in Ethiopia has produced some 3,000 sophisticated artifacts made by “a species that was technologically adept…most scientists doubt that Australopithecus had the mental acuity or manual dexterity to create tools for cutting and chopping.” More recently, a 2015 article in Nature reported on “flints…hammers, and anvils in Kenya” dating to 3.3 mya. H. sapiens is a viable candidate to have made these tools since fossils and artifacts indistinguishable from, or best attributable to, H. sapiens predate this time period. The third dating puzzle that causes one to look differently at H. erectus involves the recent determination that H. erectus dates to at least 1.85 mya in Eastern Europe and “reveals that Eurasia was probably occupied before Homo erectus appears in the East African fossil record.” This a further challenge to the view that a primitive H. erectus was evolving from an ape-like ancestor for millions of years before venturing out of Africa. Given these three dating issues, it is apparent why some prominent evolutionists are calling for the sinking of H. erectus, and why leading evolutionist Curtis Stringer explained regarding H. erectus, “everything now is in flux…It’s all a mess” and “We don’t have a clue” as to what migrated from Africa, when it emerged, or even where H. erectus itself originated. The mess begins to clear with the elimination of H. erectus. Three claimed transitional forms shown in Figure 2 resemble H. erectus but are sometimes identified as separate species. These include H. ergaster, a group of fossils found in east Africa (dating to approximately 1.5 mya); H. heidelbergensis (600,000 ya); and H. antecessor (800,000 ya to 200,000 ya). Since H. erectus preceded H. ergaster, H. heidelbergensis, and H. antecessor, these so-called transitional forms did not transition into H. erectus, nor into H. sapiens when H. erectus is properly sunk. As explained below, there is support in the scientific literature for eliminating all three classifications. H. antecessor, which is linked to the Gran Dolina site in Spain, is also a questionable classification. As one evolutionist stated, “This hominid had the face of a sapiens, a mandible approaching heidelbergensis, and premolars like ergaster. What to call such an hombre? If you say it’s not heidelbergensis, it has to be a new species….and if you don’t name it, someone else will.’” Considering that the species is described as having “a totally modern face,” and that the classifications he resembles can be placed into H. sapiens, H. antecessor can also be so assigned. The final members of the Homo genus to be discussed are H. habilis and H. rudolfensis, sometimes jointly called “early Homo.” These two classifications are very important because they are often regarded as the earliest Homo species, with H. rudolfensis dating to more than 2 mya. …it must be remembered that two groups of specimens are involved: one from Bed I and the other from Bed II…It is therefore by no means clear that the Bed I and Bed II groups of specimens necessarily belong to the same species…it would seem that there is more reason for associating the Bed I group of specimens with Australopithecus and the Bed II group with Homo erectus than there is for associating the Bed I and II groups with each other. Rather than propose sinking H. habilis into Australopithecus, however, Tim White and Donald Johanson suggested that between 3 mya and 1.8 mya, H. habilis underwent no evolutionary progression; then by 1.6 mya, there came an “abrupt transition,” in which the three-foot-tall H. habilis evolved into the modern sized H. erectus over the span of only 200,000 years. This “growth spurt” theory has since been completely invalidated, as H. erectus is now widely dated to nearly 2 mya and, as Wolpoff explains, even H. sapiens predates H. habilis when H. erectus is properly sunk. When the H. habilis fossils are properly divided into Australopithecus or H. erectus (which can be sunk into H. sapiens), it leaves only H. rudolfensis to be addressed. H. rudolfensis dates to approximately 2.3 mya and is linked to Richard Leakey, the son of Louis. While digging at Lake Rudolf (Kenya) in 1972, Richard found the famous KNM-ER 1470 and KNM-ER 1590 skulls, the KNM-ER 1481 leg bones, and the KNM-ER 1472 femur. The fossils have been described as resembling H. sapiens in morphology and size. The KNM-ER 1470 skull was 752 cc and described by Leakey as “remarkably reminiscent of modern man, lacking the heavy and protruding eyebrow ridges and thick bone characteristics of Homo erectus.” KNM-ER 1590 was similar in size even though the individual died at approximately age eight. … proportions of the ilium (KNM-ER 3228) are much like those of later homo and unlike all known australopithecine hips…The proportions of the femora (KNM-ER 1472 and 1481) are more like H. erectus than any species of Australopithecus…The proportions of the talus (KNM-ER 813) are much more like H. sapiens than are other Plio-Pleistocene hominid tali (Wood 1974). …there are at Koobi Fora leg fossils whose later homo-like morphology contrasts with that of the more australopithecine-like morphology of the Olduvai remains. These relatively derived remains…are found alongside a specimen such as KNM-ER 3735, which is judged to resemble the more primitive OH 62 skeleton. An analysis of estimated stature/body weight relationships also shows these two Koobi Fora femora to be consistent with modern human and archaic H. sapiens relationships, while the australopithecine-like Olduvai H. habilis remains are more consistent with those of the living African apes. 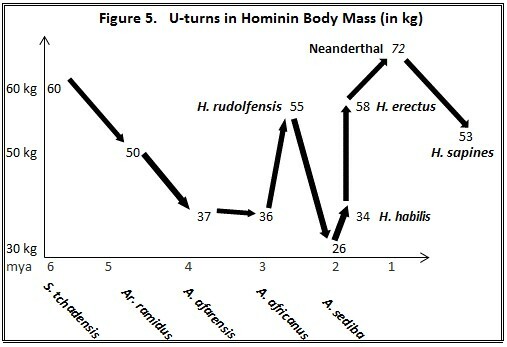 This evidence suggests that H. rudolfensis can be sunk into H. sapiens, and it also demonstrates the unworkable evolutionary U-turn for those proposing a H. rudolfensis to H. habilis to H. erectus sequence. Due to considerations such as age and the limited number of fossils, some have questioned the legitimacy of H. rudolfensis. Some evolutionists classify the fossils as a type of Australopithecus, or claim that the H. rudolfensis fossils are a variety of A. africanus. Yet, such assignments are made primarily because key H. rudolfensis fossils are often left out when comparative studies are performed (a common approach when arguing for a favored species or fossil assignment), and because A. africanus happens to date to the same general period. When one considers the primitive nature of A. africanus, discussed below, such an assignment is seen as completely unsatisfactory. Further, new fossils (primarily KNM-ER 62000) found near Koobi Fora, Kenya and dating between 1.78 and 1.95 mya were announced by a Meave Leakey team in August, 2012. Based on various fossil characteristics including a flat face that was suggested in previous H. rudolfensis fossils, the Leakey team confirmed the appropriateness of the classification and the fossils also confirmed “the presence of two contemporary species of early Homo, in addition to Homo erectus.” Yet, the finds also raise the question of how three different Homo species (rudolfensis, erectus, and habilis) co-existed in the same area and at the same time if they occupied the same ecological niche and were locked in a struggle for survival. The confusion dissipates if H. habilis is properly sunk and if H. rudolfensis and H. erectus are viewed as part of the same diverse species, H. sapiens. To recap, it is appropriate to sink all claimed Homo transitional species into H. sapiens, with the exception of H. habilis, which appears to consist of australopithecine and H. erectus fossils that should be reassigned. When this is done, it leaves H. sapiens alone in the Homo genus, and the revised figure looks suspiciously like Special Creation. Figure 3 illustrates this reassignment process. Is such a drastic pruning of the human tree really plausible? Yes, and support was recently provided by the Dmanisi finds, as reported in a 2013 issue of Science that set “off a small bomb in the field.” There have now been five skulls found at the Dmanisi site; all skulls are dated to 1.8 mya and are considered to be H. erectus. What has puzzled the scientific community is that the five skulls vary enormously in size and morphology (even though the variation among the fossils is no greater than that observed in H. sapiens). Depending on the skull, the Dmanisi fossils can be described as resembling H. habilis, H. erectus, or H. rudolfensis. Those involved with the finds concluded that there is “growing evidence that…variation in…fossil hominids tends to be misinterpreted as species diversity, especially when single fossil specimens from different localities are compared…” Extending this conclusion to African fossils, the article stated “morphological diversity in the African fossil Homo record around 1.8 [mya] probably reflects variation between…a single evolving lineage; which is appropriate named H. erectus” and concluded that, most probably, “H. habilis and H. rudolfensis belong to a single evolving Homo lineage.” While the article names the single lineage to be H. erectus, it has been explained that there is ample reason for sinking H. erectus into H. sapiens and many evolutionists support this move. How could anyone proposing such a trimming of the human tree be considered an evolutionist? In most cases, it is because of their faith that the australopithecines are a legitimate transitional form leading to Homo. This possibility will now be addressed. The Australopithecines, Can They Save the Story? Many evolutionists believe that Australopithecus gave rise to Homo about 2.3 mya and, based on the fossil dates, back an A. afarensis – A. africanus – H. rudolfensis sequence. The story of the Australopithecus genus began in 1924 when anatomist Raymond Dart obtained a small juvenile skull found in a cave near Taung, South Africa. The “Taung Child” was initially believed to be an ape (Australopithecus means “southern ape”) but Dart later announced Australopithecus africanus as mankind’s ancestor. A. africanus had an estimated cranial capacity of approximately 460 cc and lived between 2 and 3 mya. In 1974, Donald Johanson extended man’s evolutionary history with the announcement of “Lucy.” The find was classified as Australopithecus afarensis. This species is now claimed to have lived 3 to 3.6 mya. Lucy is believed to have been approximately 3.5 feet tall, and to have had a cranial capacity of less than 400 cc. Amazingly, Johanson’s team claimed that, based primarily on Lucy’s pelvis, A. afarensis was bipedal and “Lucy’s hips and the muscular arrangement of her pelvis would have made it as hard for her to climb trees as it is for modern humans.” In 1979, following Mary Leakey’s announcement of the Laetoli footprints, Johanson’s team quickly attributed these to Lucy and said that the tracks ended speculation about the bipedal status of A. afarensis. It should also be understood that Johanson initially saw Lucy’s hip as chimp-like, “which meant that Lucy couldn’t possibly have walked like a modern human.” Later, however, as Johanson explains in the Nova documentary, In Search of Human Origins, team member Owen Lovejoy concluded that the pelvis had been deformed during fossilization and he actually reshaped the mold of Lucy’s hip with a power drill so that “after taking the kink out of the pelvis, it all fit together perfectly…As a result, the angle of the hip looks nothing like a chimps, but a lot like ours.” Using such methods, one can imagine that any claimed hominin could be made to appear as an upright walker capable of making human-like footprints. It is also clear that A. africanus is discredited as leading to the modern looking H. rudolfensis because, while A. africanus is one of the more recent australopithecine species, it is now known to have had an extremely primitive morphology and, appearing in the fossil record until around 2 mya, it could not have transitioned into modern-looking H. rudolfensis who appears around 2.3 mya. Further, it is now clear that A. africanus is more primitive and ape-like than A. afarensis, even though A. africanus is on the order of one million years younger, thereby creating another U-turn if an A. afarensis – A. africanus – H. rudolfensis sequence is suggested. …the body proportions of africanus were actually more apelike—and perhaps more suited to a life in the trees—than those of afarensis, its presumed ancestor…the skeleton suggests that the path from the apes, toward humanlike body proportions—shortened arms and longer legs—and the terrestrial way of life that went with them, was not at all straightforward. It may have included a temporary return to a lifestyle that included more tree-time. The total morphological pattern…is certainly the most ape-like of any Pliocene or Pleistocene hominoid tibia yet recovered, being even more ape-like than those of A. afarensis…We, thus, question the ability of this tibia to function in the same way as in a human…A. africanus was extremely ape-like in its morphology, and possibly arboreally adapted…We are struck by the fact that no single feature can be used to separate this tibia unequivocally from that of a chimpanzee…[and it] begs a re-analysis of the… relationships of A. africanus and A. afarensis…it is difficult to reconcile these features with the interpretation of White et al. (1983) that A. afarensis was ancestral to A. africanus. In April, 2010, A. sediba was announced in Science. The fossils date from 1.95 to 1.78 mya. A. sediba appears to have had a cranial capacity of 420 to 450 cc and may have stood just over 4 feet tall. While some evolutionists suggest it could be classified as Homo due to its small teeth and claimed bipedal status, this is doubtful considering that H. sapiens (once H. erectus is sunk) dates to at least 2 mya and H. rudolfensis dates to 2.3 mya. The announcement of A. sediba acknowledged this difficulty, stating it “is seemingly at odds with” older or contemporaneous Homo fossils but speculated that perhaps “Au. sediba split from Au. Africanus before the earliest appearance of Homo.”  Still, many unsupported assumptions are required to work A. sediba into any human evolutionary sequence. Moreover, it is increasingly likely that—as with a number of other hominins—A. sediba is an illegitimate mixture of australopithecine and H. sapiens fossils; these fossils may have been deposited in a pit along with dozens of other species due to flood waters. In 2014, New Scientist featured an article entitled “Human ‘missing link’ fossils may be jumble of species.” The article explained that “one of our closest long-lost relatives may never have existed. The fossils of [A.] sediba, which promised to rewrite the story of human evolution, may actually be the remains of two species…” The article featured the work of two specialists from Tel Aviv University who had just presented findings at a paleoanthropology society meeting suggesting that the spinal column of A. sediba was actually a mix of H. erectus vertebrae and vertebrae belonging to Australopithecus, perhaps to an existing species. A similar conclusion applies to the lower jawbones attributed to A. sediba. Not surprisingly, New Scientist reported that discoverer Lee Berger disagrees, but the suggestion in the article that “it is possible that one A. sediba had an Australopithecus-like spine and Homo-like jaw, while another had a Homo-like spine and Australopithecus-like jaw” does little to provide confidence in the validity of A. sediba. Multivariate studies of several anatomical regions, shoulder, pelvis, ankle foot, elbow and hand are now available for the australopithecines…the common view, that these fossils are similar to modern man or that…they resemble the African great apes, may be incorrect. Most of these fossil fragments are in fact, uniquely different from both man and man’s nearest living genetic relatives, the chimpanzee and gorilla. To the extent that resemblances exist with living forms, they tend to be with the orang-utan. As the australopithecines are increasingly exposed as having nothing to do with human evolution, other candidates have emerged. One attempt to fill the void is based on a fossil cranium from Kenya (KNM-WT 4000) and the creation of the classification Kenyanthropus platyops (3.5 mya). Yet, the cranium size is within the range of A. afarensis and A. africanus and most evolutionists have had lukewarm reactions, as the cranium was pieced together from 1,100 fragments and, warns Tim White, has “extensive deformation.” White believes it is a variant of A. afarensis. In recent years, a number of possible human ancestors that date prior to 4 mya have been announced. Given that there is no viable transition from the australopithecines (or other primate) to Homo, it is clear that these finds have nothing to do with human evolution. What is interesting, however, is that these finds expose many long-held assumptions about human evolution as unfounded. In 1994, certain craniodental fossils were announced and provisionally assigned to Australiopithecus, based on ten teeth that were “far closer to that of a chimpanzee than to any known hominid,” and “centered in the chimpanzee ranges.” Other cranial fossils were described as having “a strikingly chimpanzee-like morphology.” Some explained that “the published fossils are so chimp-like that they may represent the long-lost ancestor of the chimp, not human lineage.” However, Tim White and other team members reasoned that, at an age of 4.4 mya, the fossils (and those of Ar. kadabba (5.2-5.8 mya) that were introduced in 2004) were close to the long-agreed upon date of 5 to 7 mya for the last common ancestor between the chimpanzee and humans (CLCA). Thus, it was reasoned that hominin fossils of this age would be very chimp-like and the fossils could be from a valid human ancestor. But not everyone agrees with the team’s interpretations about how Ar. ramidus walked upright and what it reveals about our ancestors…researchers are focusing intently on the lower skeleton, where some of the anatomy is so primitive that they are beginning to argue over just what it means to be “bipedal.” The pelvis, for example, offers only “circumstantial” evidence for upright walking, says Walker. Second, if Ar. ramidus is put in an evolutionary sequence between Sahelanthropus (S.) tchadensis and A. afarensis, a significant evolutionary U-turn is involved with regard to cranial capacity and body mass. For example, S. tchadensis had a cranial capacity estimated at 360 cc, while the best estimate for Ar. ramidus is 300 cc (a range of 290 – 310 cc). Likewise, S. tchadensis had an estimated body mass of 60 kg versus 50 kg for Ar. ramidus. But this issue goes much deeper than being led astray by fossil teeth. Given the dates of Ar. ramidus and Ar. kadabba between 4.4 and 5.8 mya, the question arises as to why Ardi’s function differs so significantly from chimpanzees, when the evolutionary establishment has, for decades, held that the CLCA lived no more than 5 to 7 mya and was very similar to the chimpanzee in form and function. Since Ardi did not fit the long-held expectations of species close to the CLCA, the White team had two options. They could have concluded that Ar. ramidus was not closely related to humans and chimpanzees and not on the evolutionary timeline of H. sapiens. However, this would have meant that Ardi would be of little importance. The alternative was to claim that the long-held consensus of the CLCA being chimp-like in appearance, plus the presumed date of 5-7 mya had been in error for decades. White’s team predictably opted for the latter option, but huge problems causing on-going debates surfaced with these claims. Since the early 1970’s, evolutionists have assured us that part of the reason why such faith can be placed in the fossil record is that the 5-7 mya date suggested for the CLCA has been independently verified using molecular clock studies. These studies look at the differences in partial DNA sequences between the chimpanzee and modern humans and then, based on an assumed average mutation rate, predict when the CLCA lived (how long ago the two genomes were identical). A common claim is that molecular clocks are independent of the fossil record and are more reliable than fossils at predicting when the CLCA may have lived. Human evolutionary studies are not a new science where every new find revolutionizes the interpretations of our past…A purported fossil ancestor that must overturn nearly all we know about our evolution to fit into our lineage is unlikely to be such [a human] ancestor…it is curious that in a century-old race for superlative hominid fossils on a continent currently populated with African apes, we consistently unearth nearly complete hominid ancestors and have yet to recognize even a small fragment of a bona fide chimpanzee or gorilla ancestor. In the second article from 2012, new evidence based on measurements involving whole genome sequencing of newborn babies suggested that “mutations arise more slowly in humans than previously thought.” The article explained that if these mutation rates are extrapolated into the past, there would be dramatic implications such as changing the human/orangutan split from the 9-13 mya estimates based on the fossils, to 34-46 mya. Since such dates are not acceptable in the eyes of most evolutionists (due to expectations based on the fossils), the article discussed that some researchers propose assuming a different rate of mutation in the past, presumably one that would fit with the fossil evidence. But if such adjustments are made, the mutation rate would essentially be a plug number to fit the fossil evidence. Other fossils dating to 6 mya and vying for the “oldest hominid” title are from Kenya and identified as Orrorin tugenenssis. The fossils were found by a French team including Marvin Pickford and others. The fossils consist of small jaw fragments, isolated teeth, finger and arm bones, and some partial femurs. The find has caused much sparring with the TM-266 team and both teams question whether the other team’s fossils should be considered as more closely related to the chimpanzee. Speaking of TM-266, one paleoanthropologist explains, “If you define hominids by a reduction in the canines and premolars, then it’s a hominid…But if a hominid is going to be defined by walking upright on two feet, you can’t tell…” Pickford and others fired back in a letter to Nature, “…we believe that Sahelanthropus was an ape.” Brunet replied that other researchers were trying to promote their find at the expense of TM-266, while misrepresenting its morphology. Orrorin tugenenssis is also vulnerable to criticism as a valid ancestor of Homo. Owen Lovejoy believes that the femur resembles that of a chimpanzee, and that the animal spent most of its time in trees. This sort of squabbling is common among competing teams and all that is accomplished is to show the weaknesses in the story tabled by each side. 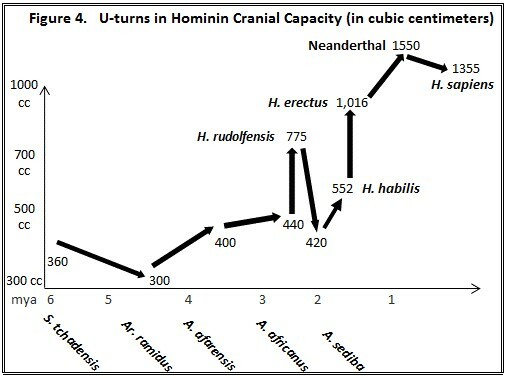 The collective failure of human evolutionary claims is evident in plots of cranial capacity and body mass as shown in figures 4 and 5. These graphs reveal multiple evolutionary U-turns and unworkable transitions among many of the so-called transitional forms discussed in this paper. Thus, not only are students being deceived when shown drawings such as in Figure 1, but it is increasingly clear that, counter to the most fundamental assumption in paleoanthropology, fossils are not good indicators of genetic relationships and, therefore, of man’s supposed evolutionary past. This fundamental failure of paleoanthropology is now being discussed in the scientific literature (though it will not appear in the biology textbooks) and means, quite literally, that the field of paleoanthropology is in danger of becoming clueless. the phylogenetic hypotheses based on the craniodental data were incompatible with the molecular phylogenies for the groups. Given the robustness of the molecular phylogenies, these results indicate that little confidence can be placed in phylogenies generated solely from higher primate craniodental evidence. The corollary of this is that existing phylogenetic hypotheses about human evolution are unlikely to be reliable. Accordingly, new approaches are required to address the problem of hominin phylogeny. …craniodental data can return impressive levels of statistical support (e.g., 97%) for…phylogenetic relationship that are most likely incorrect. In other words, cladistic analyses of higher primate craniodental morphology may yield not only “false-positive” results, but false-positive results that pass, by a substantial margin the statistical tests favored by many researchers. These conclusions are staggering and mean that, counter to the most fundamental underlying assumption in paleoanthropology, craniodental fossils are not a valid indicator of genetic relationships. Yet, others agree with Wood and Collard. A 2012 paper in the Journal of Human Evolution reported that several studies comparing inferences made from the fossil evidence with those from genetic studies have “found that morphological data could not recover the precise genetic relationships of the primate taxa,” and acknowledged that predictions based on craniodental characteristics must be called into question. Why is it so difficult to interpret the fossils? …that features shared by humans and orangutans (low cusps, shallow intercuspal notches, etc.) are indicative of a recent common ancestry, when in fact these are probably only signs of similar diet. In short, although study of molar morphology may yield substantial insights into diets of fossil hominoid primates, there may be severe limitations to their suitability for phylogenetic inference. Another problem is that estimating the age of a fossil specimen at death is closely linked to the size and emergence of teeth, and estimating the overall size that the specimen would have reached at maturity are then made. However, studies have shown extreme variation in the age of the emergence of teeth among primates. A study in the Proceedings of the National Academy of Sciences found that “emergence of the permanent teeth in wild chimpanzees is consistently later than 90% of the captive individuals. In many cases, emergence times are completely outside the known range recorded for captive chimpanzees.” Thus, the assumed age of fossil specimens at death and the resulting estimate of body size at adulthood may be in substantial error if the potential for variation in tooth emergence is not factored, yet there is little understanding of the factors that could affect emergence, or how to factor them into evolutionary studies. Also, although enamel thickness has been used to project “fossil ape and human…phylogeny…over the past century,” a study in the Journal of Human Evolution recently found that “general characterizations of hominins as having thick enamel…oversimplify a surprisingly variable craniodental trait” and may bias evolutionary reconstructions if the variation is not taken into account. Into the trash, in fact, may go the very definition of what it means to be a hominid, as there is now little agreement on what key traits identify an exclusively human ancestor. Nor is there agreement on which species led to Homo, or even whether the fossils represent different species or variation within a single species. Add to the many methodological problems the desire for funding, fame, and status among peers, and all the ingredients are present for evolutionary biology and paleoanthropology to be dominated by rash claims, blind adherence to contradictory positions, the abuse of trust naturally given to scientists, and the deception of the masses. …in spite of the patent absurdity of some of its constructs…in spite of the tolerance of the scientific community for unsubstantiated just-so stories, because we have a prior commitment, a commitment to materialism. It is not that the methods and institutions of science somehow compel us to accept a material explanation of the phenomenal world, but, on the contrary, that we are forced by our a priori adherence to material causes to create an apparatus of investigation and a set of concepts that produce material explanations, no matter how counterintuitive, no matter how mystifying to the uninitiated. Moreover, that materialism is absolute, for we cannot allow a Divine Foot in the door. Zuckerman was right. When science no longer becomes a search for truth but, instead, becomes fixated on developing the best materialistic explanation that denies the possibility of Special Creation, what results is a “presumed biological science…where to the faithful anything is possible—and there the ardent believer is sometimes able to believe several contradictory things at the same time.” It is called paleoanthropology. This “pop-science” and its close relative, evolutionary biology, can survive only by indoctrinating the young and protecting the classroom monopoly, by mocking the opposition, and by convincing or intimidating religious authorities into accepting that human origins belongs exclusively to the domain of natural science, not historical theology. Looking back, the surprise is not that the enemies of truth would seek to use false science to justify their faith in materialism, for this strategy has been used since the time of Epicurus (d. 270 B.C.). The surprise is that for the past 150 years, the Church has increasingly failed to recognize this tactic. This paper has explained that a critical evaluation of the fossil evidence leads to the conclusion that Darwin’s last icon has fallen. More specifically the evidence suggests that: 1) claims of human evolution are not supported by the fossil record; and 2) to the degree that sound inferences can be drawn, the fossil evidence is most easily reconciled with Special Creation. Unfortunately, due to the classroom and textbook monopoly held by the philosophical materialists, the Darwinian deception will continue to wreak havoc as long as good men do nothing and fail to develop an integrated strategy to restore truth. Truth matters and lies have consequences. Unless we diligently seek the truth, we will not find it. Unless we love and defend truth, we will not preserve it. If we depart from truth, then mankind will suffer the consequences, and we have not the foresight to see where the departure will yet lead. For more on the historical consequences of Darwinism, see Repairing the Breach (2008, John and Stephen Wynne) and A Catholic Assessment of Evolution Theory (2013, John M. Wynne). Catechism of the Catholic Church, Second Edition, Second Edition (Washington DC: United States Catholic Conference, Inc.—Libreria Editrice Vaticana), 1994, par. 282, pp. 73-74. Most fossils are assigned dates according to their stratigraphic location (i.e., their location in the sedimentary rocks where they are found) and according to the radiometric dating of strata immediately above, below, or parallel to the fossils. For a discussion of the unreliability of the standard geological column, see Guy Berthault, “Analysis of the Main Principles of Stratigraphy on the Basis of Experimental Data,” http://www.sedimentology.fr/, accessed 9/8/2015. For a detailed discussion of the unreliability of most radiometric dating methods, see Jean de Pontcharra, “Radioactive Dating Methods,” http://www.sciencevsevolution.org/Pontcharra.htm, accessed 9/8/2015. For evidence that C-14 dating refutes the evolutionary time-scale, see Josef Holzschuh, “Recent C-14 Dating of Fossils including Dinosaur Bone Collagen,” http://www.sciencevsevolution.org/Holzschuh.htm, accessed 9/8/2015. Cf. J. C. Sanford and Robert Carter, “God, Family and Genetics: A Biblical Perspective: Part One: Genetic Evidences Supporting the Divine Origin of Man and Family,” Proceedings of the Symposium, “‘The Two Shall Become One’: The Creation of Adam and Eve as the Foundation of the Catholic Doctrine on Holy Marriage,” Rome, Italy, September 26, 2015. William L. Straus, Jr., and A.J.E. Cave, “Pathology and the Posture of Neanderthal Man,” The Quarterly Review of Biology, vol. 32, December 1957, p. 348, see also Repairing the Breach, pp. 595-596. William L. Straus, Jr., and A.J.E. Cave, “Pathology and the Posture of Neanderthal Man,” pp. 358-359, see also Repairing the Breach, p. 596. Michael Balter, “New Work May Complicate History of Neandertals and H. sapiens, Science, vol. 326, 9 Oct. 2009, p. 224. Wesley A. Niewoehner et al., “Manual dexterity in Neanderthals,” Nature, vol. 422, 27 March 2003, p. 395, see also Repairing the Breach, p. 597. Eric Trinkaus and Cidália Duarte, “The Hybrid Child from Portugal,” Scientific American, April 2000, p. 102. Roberto Macchiarelli et al., “How Neanderthal molar teeth grew,” Nature, vol. 444, 7 December 2006, p. 748, see also Repairing the Breach, p. 598. Ian Tattersall, “How we came to be Human,” Book Excerpt, Scientific American, December 2001, p. 58, see also Repairing the Breach, p. 597. Fred H. Smith, “The Fate of the Neandertals,” Scientific American, April 2000, p. 107, see also Repairing the Breach, p. 598. Richard E. Green et al., “A Draft Sequence of the Neandertal Genome,” Science, vol. 328, No. 5979, 7 May 2010, p. 721. NIH National Human Genome Research Institute, “Complete Neanderthal Genome Sequenced,” available on-line at http://www.genome.gov/27539119, accessed 8/1/2015. Stephen H. Mongomery, “Primate brains, the ‘island rule’ and the evolution of Homo floresiensis,” Journal of Human Evolution, 65 (2013), p. 750. Neil T. Roach and Brian G. Richmond, “Clavicle length, throwing performance and the reconstruction of the Homo erectus shoulder,” Journal of Human Evolution, 80 (2015), p. 107. Lorenzo et al., “Early Pleistocene human hand phalanx form the Sima del Elefante (TE) cave site in Sierra de Atapuerca (Spain),” Journal of Human Evolution, 78 (2105) p. 114. Graeme D. Ruxton and David M. Wilkinson, Thermoregulation and endurance running in extinct hominins: Wheeler’s models revisited,” Journal of Human Evolution, 61(201), p. 169. Ann Gibbons, “When Early Hominins Got a Grip,” Science, vol 340, 26 April 2013, p. 426. Pontzer et al., “Locomotor anatomy and biomechanics of the Dmanisi hominins,” Journal of Human Evolution, 58 (2010), p. 492. Dinwall et al., “Hominin stature, body mass, and walking speed estimates based on 1.5 million-year-old fossil footprints at Ileret, Kenya,” Journal of Human Evolution, 64 (2013), p. 556. R.L. Susman, J.T. Stern, Jr., M.D. Rose, “Morphology of KMN-ER 3228 and O.H. 28 innominates from East Africa” (abstract), American Journal of Physical Anthropology, vol. 60, February 1983, p. 259, see also Repairing the Breach, p. 584. Gabriel Ward Lasker, Physical Anthropology (New York: Holt, Rinehart and Winston, Inc., 1973), p. 284, see also Repairing the Breach, p. 584. Hisao Baba et al., “Homo erectus Calvarium from the Pleistocene of Java,” Science, vol. 299, 28 February 2003, p. 1386, see also Repairing the Breach, p. 587. Various studies estimate the average body mass or weight of H. sapiens to be 53-58 kg. For recent estimates of body mass see Grabowski et al., “Body mass estimates of hominin fossils and the evolution of human body size” in the Journal of Human Evolution, Vol. 85, August 2015, pages 75-93. Also see footnote xii for Chapter 3 of Repairing the Breach for other study estimates. Christopher B. Ruff, M. Loring Burgess, “How much more would KNM-WT 15000 have grown?” Journal of Human Evolution, 80 (2015) 74-82, p. 74. Milford H. Wolpoff, Wu Xin Zhi, and Alan G. Thorne, “Modern Homo sapiens Origins: A General Theory of Hominid Evolution Involving the Fossil Evidence From East Asia,” The Origins of Modern Humans: A World Survey of the Fossil Evidence, Fred H. Smith and Frank Spencer, eds. (New York: Alan R. Liss, Inc., 1984), pp. 465-467, see also Repairing the Breach, p. 583. Milford H. Wolpoff, Paleoanthropology, p. 397. Milford H. Wolpoff, Paleoanthropology (Boston: McGraw-Hill, 1999), p. 359, see also Repairing the Breach, p. 594. William S. Laughlin, “Eskimos and Aleuts: Their Origins and Evolution,” Science, vol. 142, 8 November 1963, p. 644, see also Repairing the Breach, p. 584. John M. Wynne and Stephen A. Wynne, Repairing the Breach, (Dallas, Brown Books), 2008, p. 52. Marvin L. Lubenow, Bones of Contention (Grand Rapids, MI: Baker Books, 1992), p. 83. Rick Gore, “New Find,” National Geographic, August 2002. Steve Weiner et al., “Evidence for the Use of Fire at Zhoukoudian, China,” Science, vol. 281, 10 July 1998, pp. 251-253; Ann Gibbons, “Ancient Island Tools Suggest Homo erectus Was a Seafarer,” Science, vol. 279, 13 March 1998, pp. 1635-1637. From “A Correspondent,” “Late Pleistocene Man at Kow Swamp,” Nature, vol. 238, 11 August 1972, p. 308, see also Repairing the Breach, pp. 586-587. A.G. Thorne, P.G. Macumber, “Discoveries of Late Pleistocene Man at Kow Swamp, Australia,” Nature, vol. 238, August 11, 1972, p. 316, see also Repairing the Breach, p. 582. Ann Gibbons, “Homo erectus in Java: A 250,000-Year Anachronism,” Science, vol. 274, 13 December 1996, p. 1841, see also Repairing the Breach, p. 582. M.H. Day and T.I. Molleson, “The Trinil Femora,” in Symposia of the Society for the Study of Human Biology, Vol. XI, Human Evolution, M.H. Day, ed. (New York: Barnes & Noble Books, 1973), p. 135, see also Repairing the Breach, p. 580. Bryan Patterson, W.W. Howells, “Hominid Humeral Fragment from Early Pleistocene of Northwestern Kenya,” Science, vol. 156, 7 April 1967, p. 64, see also Repairing the Breach, p. 572. Ibid., p. 65, see also Repairing the Breach, p. 573. W.W. Howells, “Homo erectus in human descent: ideas and problems,” Homo erectus: Papers in Honor of Davidson Black, Becky A. Sigmon and Jerome S. Cybulski, eds. (Toronto: University of Toronto Press, 1981), pp. 79-80, see also Repairing the Breach, p. 573. Henry M. McHenry, “Fossils and the Mosaic Nature of Human Evolution,” Science, vol. 190, 31 October 1975, p. 428, see also Repairing the Breach, p. 573. Charles E. Oxnard, “The place of the australopithecines in human evolution: grounds for doubt?” Nature, vol. 258, December 4, 1975, p. 394, see also Repairing the Breach, p. 573. Mary D. Leakey, “Footprints in the Ashes of Time,” National Geographic, April 1979, pp. 446, 453, see also Repairing the Breach, p. 574. From M.D. Leakey and R.L. Hay, “Pliocene footprints in the Laetolil Beds at Laetoli, northern Tanzania,” Nature, vol. 278, 22 March 1979, pp. 320, 323, see also Repairing the Breach, pp. 574-575. Donald C. Johanson and Maitland A. Edey, Lucy, The Beginnings of Humankind (New York: Simon and Schuster, 1981), p. 250, see also Repairing the Breach, p. 575. R.H. Tuttle, D.M. Webb, and M. Baksh, “The pattern of little feet,” American Journal of Physical Anthropology, vol. 78, February 1989, p. 316, see also Repairing the Breach, p. 575. Russell H. Tuttle, “The Pitted Pattern of Laetoli Feet,” Natural History, March 1990, pp. 63-64, see also Repairing the Breach, p. 575. R.H. Tuttle, D.M. Webb, and M. Baksh, “Did Australopithecus afarensis make the Laetoli G footprint trails?” American Journal of Physical Anthropology, 1991 Supplement, p. 175, Repairing the Breach, p. 576. From “Old Mysteries Solved – Sort of” Insight on the News, March 10, 1997, p. 41, see also Repairing the Breach, p. 579. Erella Hovers, “Archaeology: Tools go back in time,” Nature, News & Views, 521, 21 May 2015, p. 294. Ferring et al., “Earliest human occupations at Dmanisi (Georgian Caucasus) dated to 1.85-1.78 Ma,” PNAS, June 28, 2011, vol. 108, no. 26, p. 10432. James Shreeve, “Erectus Rising,” Discover, September 1994, p. 82, see also Repairing the Breach, p. 582. Robert C. Cowen, “Java Man ‘Ages’ a Million Years, Upsets Theories,” The Christian Science Monitor, February 25, 1994, p. 3, see also Repairing the Breach, p. 582. David Dean and Eric Delson, “Homo at the gates of Europe,” Nature, vol. 373, 9 February 1995, p. 473, see also Repairing the Breach, p. 587. Alan Walker, “Perspectives on the Nariokotome Discovery,” The Nariokotome Homo Erectus Skeleton, Alan Walker and Richard Leakey, eds. (Cambridge, MA: Harvard University Press, 1993), p. 421, see also Repairing the Breach, pp. 587-588. Ann Gibbons, “African Skull Points to One Human Ancestor,” Science, vol. 295, 22 March 2002, p. 2193; and Berhane Asfaw et al., “Remains of Homo erectus from Bouri, Middle Awash, Ethiopia,” Nature, vol. 416, 21 March 2002, p. 318, see also Repairing the Breach, p. 588. Michael Balter, “New Work May Complicate History of Neandertals and H. sapiens, Science, vol. 326, 9 Oct. 2009, pp. 224, 225. G. Philip Rightmire, “Homo erectus and Middle Pleistocene hominins: Brain size, skull form, and species recognition,” Journal of Human Evolution, 65 (2013), p. 249. Ann Gibbons, “A New Face for Human Ancestors,” Science, vol. 276, 30 May 1997, p. 1332, see also Repairing the Breach, p. 588. Robert Kunzig, “The Face of an Ancestral Child,” Discover, December 1997, pp. 97-98, see also Repairing the Breach, p. 588. L.S.B. Leakey, “New Finds at Olduvai Gorge,” Nature, vol. 189, February 25, 1961, p. 649, see also Repairing the Breach, p. 589. J.T. Robinson, “Homo ‘habilis’ and the Australopithecines,” Nature, vol. 205, January 9, 1965, pp. 122-123, see also Repairing the Breach, p. 590. Donald C. Johanson et al., “New partial skeleton of Homo habilis from Olduvai Gorge, Tanzania,” p. 208, see also Repairing the Breach, p. 592. Bruce Bower, “Early Human Skeleton Apes Its Ancestors,” Science News, vol. 131, May 30, 1987, p. 340, see also Repairing the Breach, p. 592. Michael Hopkin, “Twin fossil find adds twist to human evolution.” Taken from www.nature.com on 08/08/07, see also Repairing the Breach, p. 594. Bernard Wood and Mark Collard, “The Human Genus,” Science, vol. 284, 2 April 1999, pp. 66-70, see also Repairing the Breach, p. 594. Robert J. Blumenschine et al., “Late Pliocene Homo and Hominid Land Use from Western Olduvai Gorge, Tanzania,” Science, vol. 299, 21 February 2003, p. 1220, see also Repairing the Breach, p. 594. Ann Gibbons, “Who Was Homo habilis—And Was it Really Homo?” Science, vol. 332, 17 June 2011, p. 1370. From “Leakey’s new skull changes our pedigree and lengthens our past,” Science News, November 18, 1972, p. 324, see also Repairing the Breach, p. 591. Wolpoff, Paleoanthropology, p. 368, see also Repairing the Breach, p. 591. Dean Falk, “Cerebral Cortices of East African Early Hominids,” Science, vol. 221, 9 September 1983, pp. 1072-1073, see also Repairing the Breach, p. 592. Henry M. McHenry, “Early Hominid Postcrania: Phylogeny and Function,” p. 260, see also Repairing the Breach, p. 593. Bernard Wood, “Origin and evolution of the genus Homo,” Nature, vol. 355, 27 February 1992, p. 786, see also Repairing the Breach, p. 593. Meave G. Leakey et al., “New fossils from Koobi For a in northern Kenya confirm taxonomic diversity in early Homo,” Nature, 488, 2001-2004, 9 August 2012, 201-2004. Ann Gibbons, “Stunning Skull Gives a Fresh Portrait of Early Humans,” Science, vol. 342, 18 October, 2013, p. 297. David Lordkipanidze et. al. “A Complete Skull from Dmanisi, Georgia, and the Evolutionary Biology of Early Homo” Science, vol. 342, 19 October 2013, p. 330. Donald C. Johanson, “Face-to-Face with Lucy’s Family,” National Geographic, March, 1996, p. 114, see also Repairing the Breach, p. 575. M.D. Leakey and R.L. Hay, “Pliocene footprints in the Laetoli Beds at Laetoli, northern Tanzania,” Nature, vol. 278, 22 March 1979, pp. 317-323, see also Repairing the Breach, p. 574-578. Henry M. McHenry, “Early Hominid Postcrania: Phylogeny and Function,” Integrative Paths to the Past: Paleoanthropological Advances in Honor of F. Clark Howell, Robert S. Corruccini and Russell L. Ciochon, eds. (Englewood Cliffs, NJ: Prentice Hall, 1994), p. 255, see also Repairing the Breach, pp. 578-579. Jack T. Stern, Jr. and Randall L. Susman, “The Locomotor Anatomy of Australopithecus afarensis,” American Journal of Physical Anthropology, vol. 60 (1983), pp. 279, 298-299, see also Repairing the Breach, p. 576. Ann Gibbons, “Anthropologists Take the Measure of Humanity,” Science, vol. 264, 15 April 1994, p. 350, see also Repairing the Breach, p. 577. Bruce Bower, “Hominids: Down-to-earth or up a tree?” Science News, April 9, 1994, p. 231. Mark Collard and Leslie C. Aiello, “From forelimbs to two legs,” Nature, vol. 404, 23 March 2000, p. 339, see also Repairing the Breach, p. 577. John Horgan, “Standing Tall,” Scientific American, October 1994, p. 22, see also Repairing the Breach, p. 577. David J. Green and Zeresenay Alemseged, “Australopithecus afarensis Scapular Ontongeny, Function, and the Role of Climbing in Evolution,” Science, vol. 338, 26 October, 2012, p. 514, 517. From the Nova series, “In Search of Human Origins, Part One,” transcript available on-line at http://www.pbs.org/wgbh/nova/transcripts/2106hum1.html, accessed August 1, 2015. For a detailed analysis of Lucy, see the write-up on Logos Research Associates web site at http://www.logosra.org/#!lucy/c3wa. The site has other very good evaluations of claimed transitional forms and other errant evolutionary claims, accessed 9/8/2015. Bernard Wood, “A precious little bundle,” Nature, vol. 443, 21 September 2006, p. 278. James Shreeve, “New Skeleton Gives Path From Trees to Ground an Odd Turn,” Science, vol. 272, 3 May 1996, p. 654, see also Repairing the Breach, p. 600. Lee R. Berger and Phillip V. Tobias, “A chimpanzee-like tibia from Sterkfontein, South Africa and its implications for the interpretation of bipedalism in Australopithecus africanus,” Journal of Human Evolution, 1996, pp. 343, 347, see also Repairing the Breach, p. 601. Ronald J. Clarke and Phillip V. Tobias, “Sterkfontein Member 2 Foot Bones of the Oldest South African Hominid,” Science, vol. 269, 28 July 1995, pp. 521, 524, see also Repairing the Breach, p. 600. Some evolutionists have tried to salvage a role for A. africanus by claiming that it led to Homo because A. africanus was more similar to H. habilis. This argument is flawed in that H. habilis (absent fossils belonging to H. rudolfensis, H. erectus, or H. sapiens) should be assigned to the australopithecines and the admission that H. habilis did not lead to H. erectus due to the half-million year contemporary status of the two species at the same site. Charles W. Petit, “The hominid who ate antelope for dinner,” U.S. News & World Report, May 3, 1999, p. 53, see also Repairing the Breach, p. 602. Elizabeth Culotta, “A New Human Ancestor?” Science, vol. 284, 23 April 1999, pp. 573, 572, see also Repairing the Breach, p. 602. Maeve Leakey and Alan Walker, “Early Hominid Fossils from Africa,” Scientific American, June 1997, p. 76, see also Repairing the Breach, p. 574. Lee R. Berger et al, “Australopithecus sediba: A New Species of Homo-Like Australopith from South Africa,” Science, vol. 328, 9 April 2010, pp. 195-204. From “Human ‘missing link’ fossils may be jumble of species,” New Scientist, This Week, 9 April 2014, available on-line at https://www.newscientist.com/article/mg22229643-200-human-missing-link-fossils-may-be-jumble-of-species, accessed August 15, 2015. Quoted from Henry M. Morris, That Their Words May Be Used Against Them (El Cajon, Ca: Institute for Creation Research, 1997), p. 202; originally from Stephen Jay Gould, “A Short Way to Big Ends,” Natural History, vol. 95, January 1986, p. 28, see also Repairing the Breach, p. 47. Charles E. Oxnard, “Australopithecus vs. the computer,” University of Chicago Magazine, Winter 1974, pp. 11-12, see also Repairing the Breach, p. 47. Charles E. Oxnard, The Order of Man (New Haven, CT: Yale University Press, 1984), pp. 316, 331, see also Repairing the Breach, p. 47. Ibid., pp. iii-iv (Nota Bene). Maeve G. Leakey et al., “New hominin genus from eastern Africa shows diverse middle Pliocene lineages,” Nature, vol. 410, 22 March 2001, pp. 438-439, see also Repairing the Breach, p. 604. Tim White, “Early Hominids—Diversity or Distortion?” Science, vol. 299, 28 March 2003, p. 1995. Tim D. White, Gen Suwa, and Berhane Asfaw, “Australopithecus ramidus, a new species of early hominid from Aramis, Ethiopia,” Nature, vol. 371, 22 September 1994, pp. 306-307. Ann Gibbons, “In Search of the First Hominids,” Science, vol. 295, 15 February 2002, p. 1215. See Science, vol. 326, 2 October 2009. Tim White et al., “Neither chimpanzee nor human, Ardipithecus reveals the surprising ancestry of both,” PNAS, April 21, 2015, vol. 112, no. 16, 4878-4879. Ann Gibbons, “A New Kind of Ancestor: Ardipithecus Unveiled,” Science, vol. 326, 2 October 2009, p. 37. Esteban E. Sarmiento, “Comment on the Paleobiology and Classification of Ardipithecus ramidus,” Science, vol. 38, 28 May 2010, 1105-b. From “Supporting Online Material for The Ardipithecus ramidus Skull and Its Implications for Hominid Origins,” 2 October 2009, Science 326, 68 (2009), DOI: 10.1126/science.1175825, p. 8. Ann Gibbons, “A New Kind of Ancestor: Ardipithecus Unveiled, p. 40. Tim White et al., “Ardipithecus ramidus and the Paleobiology of Early Hominids,” p. 64. Tim White et al., “Neither chimpanzee nor human, Ardipithecus reveals the surprising ancestry of both,” PNAS, April 21, 2015, vol. 112, no. 16, 4883. Tim White et al., “Ardipithecus ramidus and the Paleobiology of Early Hominids,” Science, vol. 326, 2 October 2009, p. 81. Many scientists believe that Mitochondrial DNA is inherited only from the mother and that there is no mixing of male and female mtDNA from generation to generation. This would mean that mtDNA differences among humans would be the result of mutations and would give scientists access to a “molecular clock.” By counting the differences in mtDNA now present and by applying an assumed mutation rate, they are able to estimate when “mitochrondrial Eve” may have lived. the published evolutionary literature puts the origin of modern humans about 180,000 years ago…. . .[and] the measured mitochondrial DNA mutation rate for humans is, on average, ~0.00048 mutations per year…[or] about 174 mutations after 180,000 years of existence. Comparing these predictions to the range of actual human mitochondrial DNA diversity shows a striking result . . . On average, human mitochondrial DNA sequences differ at 10 positions. Ann Gibbons, “Calibrating the Mitochondrial Clock,” Science, vol. 279, 2 January 1998, p. 28. Ann Gibbons, “Turning Back the Clock: Slowing the Pace of Prehistory,” Science, vol. 338, 12 October 2012, p. 189. Michael Brunet et al., “A new hominid from the Upper Miocene of Chad, Central Africa,” Nature, vol. 418, 11 July 2002, p. 151, see also Repairing the Breach, p. 603. Bernard Wood, “Hominid revelations from Chad,” Nature, vol. 418, 11 July 2002, p. 134, see also Repairing the Breach, p. 603. Ann Gibbons, “One Scientist’s Quest for The Origin of Our Species,” Science, vol. 298, 29 November 2002, p. 1711, see also Repairing the Breach, p. 603. Kate Wong, “An Ancestor to Call Our Own,” Scientific American, January 2003, p. 59, see also Repairing the Breach, p. 603. For a listing of the sources behind the numbers in these two figures, see Repairing the Breach, Table 3-1, p. 52. Although there have been updated studies listing body mass, it does not necessarily mean that these updates are better than the sources used in Repairing the Breach. For example, at 2015 study in the Journal of Human Evolution entitled “Body mass estimates of hominin fossils and the evolution of human body size” (vol. 85, August 2015, pp 75-93) provides body mass estimates of most claimed transitional forms. However, the study is based on the assumption that the bone size to weight relationship in hominin fossils scale to the same degree as seen in modern humans. So, for example, their estimate of the body mass of A. ramidus is a mere 32 kg while the estimate of White et al. is 50 kg using different scaling assumptions. Cladistics is a “statistical method for analyzing correlations between traits across species.” Two species sharing nearly all traits will be judged more closely related than species not sharing as many traits. As with the molecular clock method, the approach assumes evolution is true and, therefore, cannot be a proof of evolution. From Mark Collard and Bernard Wood, “How reliable are human phylogenetic hypotheses?” Proceedings of the National Academy of Sciences, vol. 97, no. 9, April 25, 2000, p. 5003, see also Repairing the Breach, p. 41. From Noreen von Cramon-Taubadel and Heather F. Smith, “The relative congruence of cranial and genetic estimates of hominoid taxon relationships: Implications for the reconstruction of hominin phylogeny,” Journal of Human Evolution, 62 (2012) p. 640. Steve E. Hartman, “A cladistic analysis of hominoid molars,” Journal of Human Evolution, vol. 17 (1988), pp. 495, 497-498, see also Repairing the Breach, p. 41. Robert B. Eckhardt, “Population Genetics and Human Origins,” Scientific American, January 1972, p. 96, see also Repairing the Breach, p. 39. Aapo T. Kangas et al., “Nonindependence of mammalian dental characters,” Nature, vol. 432, 11 November 2004, p. 211, see also Repairing the Breach, p. 39. Adrienne Zihlman, Debra Bolter, and Christophe Boesch, “Wild chimpanzee dentition and its implications for assessing life history in immature hominin fossils,” Proceedings of the National Academy of Sciences, vol. 101, no. 29, July 20, 2004, p. 10541, see also Repairing the Breach, p. 39. Tanya M. Smith et al., “Variation in enamel thickness within the genus Homo,” Journal of Human Evolution, 62 (2012), p. 395. Donald C. Johanson, “The Dawn of Humans: Face-to-Face with Lucy’s Family,” National Geographic, March 1996, p. 112. David Pilbeam, “Rearranging Our Family Tree,” Human Nature, June 1978, p. 42. Ann Gibbons, “In Search of the First Hominids,” Science, vol. 295, 15 February 2002, p. 1219. Edward J. Larson and Larry Witham, “Scientists and Religion in America,” Scientific American, September 1999, pp. 89-90. Kenneth Miller, Finding Darwin’s God, (Harper Perennial, 1999), p. 244. Miller is a theist, but he rejects the possibility of God-directed evolution as he has made the problematic philosophical decision to construct a fence of naturalism around origins. Richard Lewontin, “Billions and Billions of Demons,” The New York Review, January 9, 1997, p. 31, see also Repairing the Breach, p. 136. From Stephen W. Hawking, in an interview accessed from Yahoo! News Blog The Lookout, https://www.yahoo.com/news/blogs/lookout/stephen-hawking-says-afterlife-fairy-story-150719080.html on May 16, 2011, accessed 9/8/2015. Charles Darwin, The Autobiography of Charles Darwin, Nora Barlow, ed. (New York: W.W. Norton & Company, 1958), pp.86-87, see also Repairing the Breach, p. 199. Sir Solly Zuckerman, Beyond the Ivory Tower: The Frontiers of Public and Private Science (New York: Taplinger Publishing Co., Inc., 1970), p. 64, see also Repairing the Breach, p. 33. Sir Solly Zuckerman, Beyond the Ivory Tower: The Frontiers of Public and Private Science (New York: Taplinger Publishing Co., Inc., 1970) p. 19-20. Kenneth Miller, Finding Darwin’s God, (Harper Perennial, 1999), p. 56. From John M. Wynne, Stephen A. Wynne, Repairing the Breach, Brown Books, 2008, pp. 569-570.